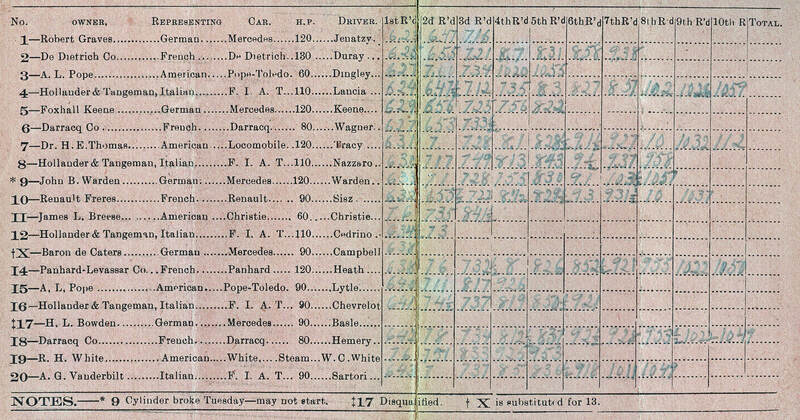 The original owner of this scoreboard tracked the times of each race car as they passed. For example, the winner of the race the #18 Darrarq was timed at 6:42 AM for lap 1 and 10:49 AM for lap 10. Only four cars were recorded for lap 10 corresponding correctly with the official results. The front of the 1905 scorecard was sponsored by "Edward M.Scott of Great Neck, maker of harness of every description" and provider of riding saddles, bridles, auto supplies, cylinder oils & greases". 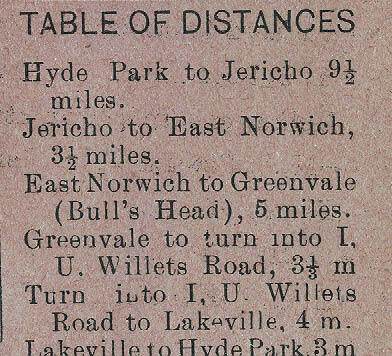 The reverse side of the scorecard featured a map of the course and more ads. 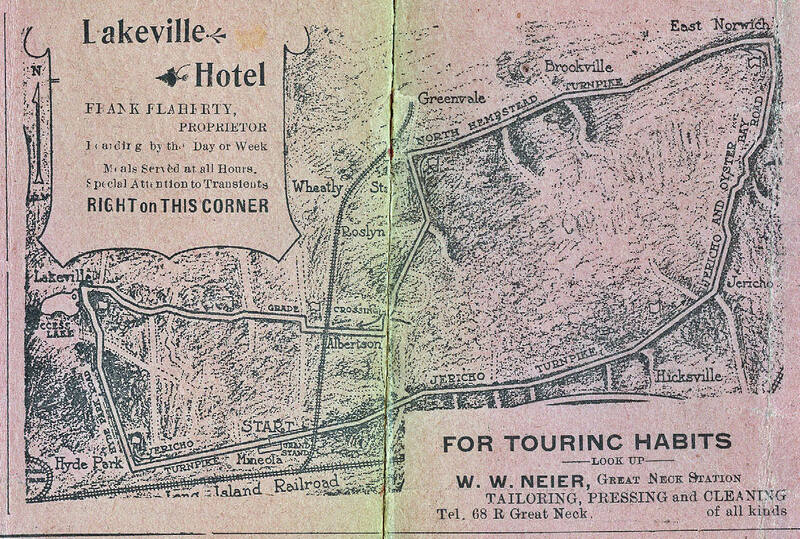 Frank Flaherty's Lakeville Hotel was prominent above the course map, promoting "Boarding by the Day or Week, Meals served at all Hours, Special Attention to Transients". The ads on the top of the scorecard were for a harness maker, a sign painter, real estate agent and an insurance broker. The Schenck Brothers in Great Neck advertised their automobile garage. A street in the Thomaston section of Great Neck was named for the Schenck family. 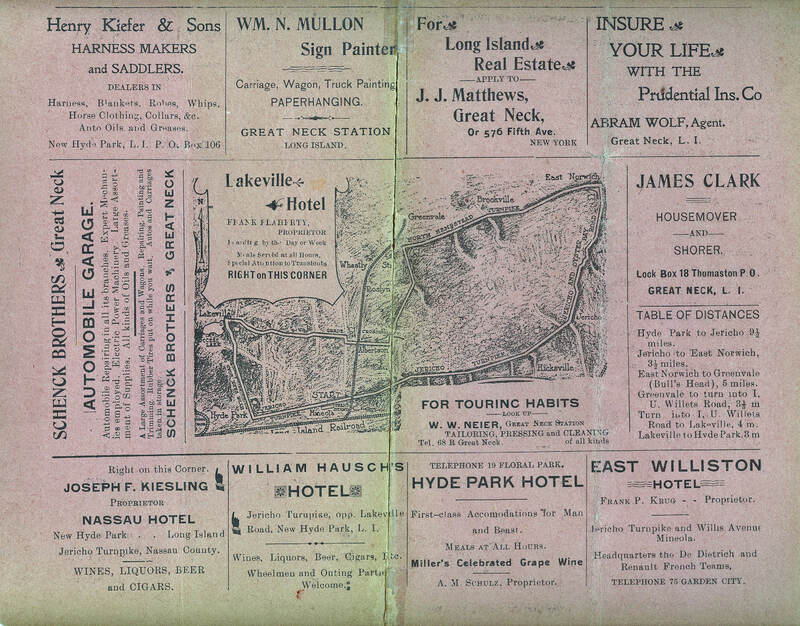 The ads on the bottom of the scorecard were for four hotels near or on the 1905 course; Nassau Hotel, William Hausch's Hotel, New Hyde Park Hotel and the East Williston Hotel "Headquarters of the De Dietrich and Renault French Teams".